THE B-MOVIE NEWS VAULT: STOCK YOUR VAULT: New DVDs & Blu-rays for 05/30/2017! STOCK YOUR VAULT: New DVDs & Blu-rays for 05/30/2017! Yeesh! First off Vault Dwellers, please allow me to apologize. I have been distracted recently (because of a fun little time-waster called FRIDAY THE 13TH: THE GAME) so I have been neglecting my duties as Vault Master. Please forgive me as I get back on track and prepare to celebrate the Vault's 17th year online! But I'm getting ahead of myself because it is time for yours truly to take a quick look back at this past Tuesday, and its short roster of new DVDs and Blu-rays from your fave cult distribution labels! Severin Films gave BLACKENSTEIN a new lease on life with some cool extras and TWO versions of the film! 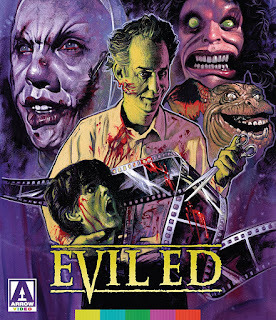 Arrow Video delivered an impressive 3-disc Limited Edition release of EVIL ED (WHY?! ), Blue Underground put out a cool FU MANCHU double feature, and Vinegar Syndrome gifted us HELLBENT and HORROR HOUSE ON HIGHWAY FIVE on Blu-ray! Scream Factory apparently took the week off so Kino Lorber jumped in with a new DVD and Blu-ray of TOUGH GUYS, and DVD-only releases for a bunch of forgotten cult titles, including HIDE AND GO SHRIEK, IRON MASTER, THE JIGSAW MURDERS, and SLAUGHTERHOUSE ROCK! I should also note that a company called InterVision put out a double feature disc that contains DARK HARVEST and (more importantly) the Vincent Price-hosted anthology, ESCAPES! There's a few other titles of interest from last week, so scroll on down to scope 'em out! Contains: Shock-O-Rama, Bacterium, Bite Me!, and The Screaming Dead.